Why Would You Choose a Non-Alcohol Hand Sanitizer? How Do You Choose a Floor Pad? Industry Standard Pad Colors have been established to differentiate the pad for the appropriate use and provide the best results. The general rule of thumb is the darker the color pad, the more coarse the pad is. Choosing the right floor pad saves time and money. Using the wrong floor pad could result in permanent surface scarring and costly repairs. Below are some basics on the best floor pad for the right application. What’s the difference between a Synthetic Floor Pad vs. Natural Floor Pads? Synthetic floor pads like those made of nylon and polyester are best for low speed scrubbing or stripping with wet solutions. They can also be used for burnishing, but it will require additional scrubbing to remove black marks and scratches to provide the proper gloss. Natural pads or pads made from natural fibers like animal hair, coconut and walnut create a coarser pad, which is ideal for burnishing. Microfiber pads absorb dust when cleaning and burnishing, which helps control air quality, making them ideal in health care facilities, schools and other heavily populated buildings. Use floor protectors on furniture. One inch diameter protectors are recommended. Floor pads with a high content of hair can produce a burning hair odor when used with high-speed applications. Foot traffic can create micro abrasions and make your floor look hazy and dull. Use a high speed burnishing pad. The pad heats and micro sands the floor to give it that wet glossy look. Floor pads that are not centered on the machine will make it hard to control. Do You Have Some Hints on Vacuum Maintenance? 1. 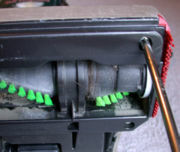 Unplug your vacuum cleaner before performing any maintenance on it. A vacuum cleaner that turns on unexpectedly while you are working on it can injure you. 2. Check the bag regularly and replace it when it is full. 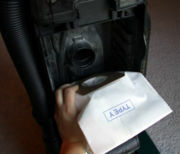 A vacuum cleaner bag that is only 1/3 full may be too full to clean efficiently. Remember that the air must pass through all the collected dust and debris, so a full vacuum cleaner bag means that the machine must work harder, or that it will not clean as well, or both. Look for a line on the bag and feel with your hand to determine about how full it is. If a working vacuum cleaner misses debris on the carpet or leaves behind fuzz where there was none, that’s also a cue to check the bag. 3. Replace any vacuum bag that is 1/3 to 1/2 full. Read the directions on the vacuum cleaner, the bag, or in the manual. Regardless of the procedure, make sure that the bag is on all the way and secure, and that any clips or holders are in place. Use the correct bag size and type for your machine. Empty the bin or tray on bagless models frequently. Most designs make it very easy to pop the bin out. 4. Clean the brush roll. 4-1. 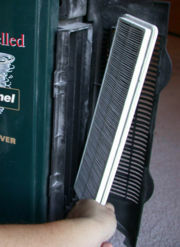 Also called a beater bar, this is the spinning brush underneath that brushes dirt out of the carpets. Look under the machine and locate the brush roll. Generally, it will be across the front of the bottom. If it is full of hair, thread, or other debris, it is time to clean it. 4-2. Remove the bottom plate. This cover may have clips or latches, or it may have a couple of screws holding it in place. Don’t lose the screws. 4-3. Notice the direction that the brush roll goes in. 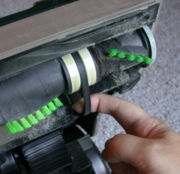 Usually, there will be a belt on one side and a corresponding track or space on the brush roll for the belt. This will help you to identify the direction. 4-4. Remove the brush roll. Generally, it will pull out of a slot on either end, then slide out from under the belt. 4-5. Use scissors or just your fingers to clean the brushes. 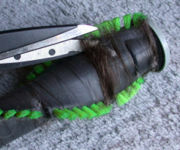 They don’t need to be spotless, but you should remove any hair or string that is wrapped around the brush. 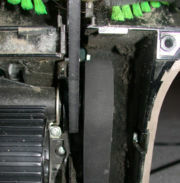 Pay special attention to the ends near the bearings and to the area around where the belt engages. A seam ripper (you can get one at a sewing goods store) works very well to cut the thinnest of hairs and strings wrapped around the brush. 5. 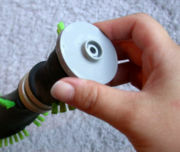 Clean and lubricate the bearings on the brush roll. 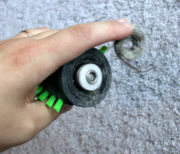 Spin the brush roll on its axle with your fingers, to verify that it spins freely. If it doesn’t, you may need to clean out the bearings more thoroughly, lubricate the bearings, replace the bearings, or replace the entire brush roll (in ascending order of expense). Unscrew the cap on either end of the brush roll. You will need to hold the cap on the opposite end. 6. Check the belt for signs of wear, and replace it if it is worn. Look for cracks, unevenness, or melted or worn spots. 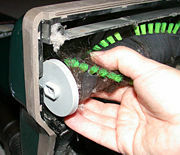 Replace the belt every 6 months to 1 year, depending on how much use your vacuum cleaner sees. Remove the brush roll as above. 7. 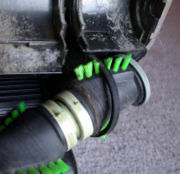 Replace or clean any filters on the vacuum cleaner. 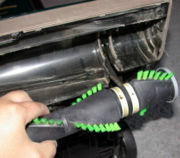 Many newer model vacuums have filters on the exhaust air to catch particles that remain in it. Read your manual to find out if yours has these, and clean or replace them periodically if it does. 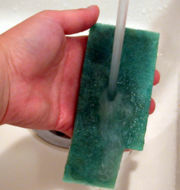 If the filter is made out of foam or plastic, you may be able to rinse it clean. Make sure it is thoroughly dry before replacing it in the vacuum cleaner. If the filter is made out of paper or fabric, you may be able to shake or pound out the debris between replacements. 8. Check the hoses for clogs and obstructions. It doesn’t happen very often, but if you have lost suction, try pushing a broomstick gently through the hoses to dislodge any larger clumps of debris that are stuck. A hook made from bent coat hanger wire can also be used to pull out or loosen clogs. 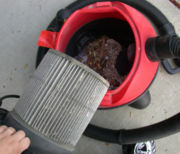 Replace or clean the filter periodically, according to how much you use the vacuum. Know how to configure the vacuum for wet pickup, if you wish to vacuum up liquids. Make sure it is correctly configured for wet or dry use each time you use it. Improve the life of your machines by using proper operating procedures, cleaning techniques, storage procedures and preventative maintenance. Contact our office to schedule an in-service with our service department. We can train users on factory recommended procedures and best uses. We also offer a full preventative maintenance schedule that we can discuss with you.